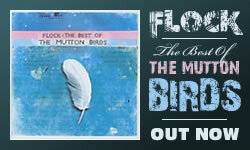 Hello Mutton Bird watchers! The newly re-formed Mutton Birds gave Peter at STYH-HQ an excuse to lock hiself away in the lab' to work on what he hopes is one of the most complete stories ever told about the history of the band, in audio form. The basis of the podcast is this: Three interviews he did with Don McGlashan, in March 1998; November 1998; and July 2010. He's edited out most of his questions because his voice was all high and squeaky back in 1998. It remains intact for the 2009 section.